Productions of Puccini’s works these days inevitably raise questions about operatic realism or, as it’s more commonly known, verismo. At first glance, operatic realism doesn’t appear to be a very complicated issue. As the nineteenth century drew to a close, composers and librettists (of the giovane scoula) extended the topical conventions established by Verdi in Rigoletto and La traviata: a focus on less-than-grand figures and the more mundane aspects of life. 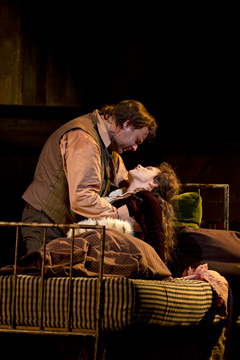 Of course, Mimi’s exasperated cry for a muff to warm her hands as she dies makes La bohème a quintessential example of this trend. On the other hand, however, what is realistic about people singing their thoughts and feelings, perhaps especially through these seemingly mundane moments? Unless you are Baudrillard and interpreting opera through the lens of the hyperreal, not much. The term "realism" is obviously a slippery one; interpretations vary depending on how it is defined. Consider, however, that the highest form of realism is imaginative truth: in the words of the Puccinian Mosco Carner, "the stage is to create an illusion of reality, not to photograph it." John Copley’s production (which has seen more than its fair share of outings since 1974) does rather well from this perspective, albeit in a highly stylized manner (the falling snow especially). Of course, the performers certainly brought this type of truth a bit nearer as well. Joseph Calleja was a vibrant Rodolfo; his Act I "Che gelida manina" was refreshing (it’s an aria that Pavarotti destroyed) despite his lackluster high C, but the tenor was at his best in the Act III quartet. There is something about his voice, which has enough edge to carry into the house but not quite enough color to convince that unsettles. Calleja’s Rodolfo isn’t quite committed enough for me; perhaps his lines need a bit more sensuality. As Mimi, Carmen Giannattasio was every bit the wilting flower: she carried the performance in a rather large way and is well on her way to becoming a true interpreter of Puccini. Her legato carries her large voice very well, she takes her time when necessary (mostly, see below), and really commits. Nevertheless, one wonders why she sang "Donde lieta" without more of a portamento during the final phrase (gut wrenching if done properly), but alas, she is still young. Fabio Capitanucci was a perfect Marcello, and it is a welcome change to hear a baritone who can sing Puccini convincingly. He created irresistible chemistry with Nuccia Focile, the evening’s Musetta, in Act II and was perfectly sensitive at the beginning of Act III. Focile was a great Musetta, except where it really counted: the forte to pianissimo high B-flat that ends "Quando me’n vo." If a singer can’t do it then that singer simply shouldn’t be singing the role. As Colline, Matthew Rose sang a fine farewell to his coat and complemented the ensemble quite well. Thomas Oliemans sang Schaunard very well, and his flair for the dramatic added a nice touch (not surprisingly, the musician is most successful of the group of Bohemians). Finally, at the heart of any performance of La bohème must be an excellent conductor, and Semyon Bychkov inspired the orchestra to heights not yet heard this season. Of course, Bychkov’s choice of tempo at times was questionable: he rushed "O soave fanciulla" and didn’t take quite enough rubato in Musetta’s Waltz; like Calleja, Bychkov might’ve let himself feel a bit deeper to give the opera that extra bit of shine. Overall then, this performance was lacking in a few key areas. Remember that La bohème is an elusive work, and in several respects an opera that really needs an extra bit of "oomph" to succeed. Yet the very fact that this performance lacked a certain gloss made it all the more believable, more "real."